Halo 2 is not the greatest thing in the world. You can't eat it, it can't keep you warm and sheltered, it doesn't cure cancer, and playing it will not make you immortal, so will you stop obsessing about it? This might startle you a bit, but (are you sitting down?) Halo 2 is not the end all be all of human existence! The thing that bothers me the most (and the reason that I'm writing this article) is that people don't actually believe this, they're told to believe it. Halo 2 has flaws. I plan to point out these flaws (however minor) in the next section. This is a screenshot from Halo 2. It's Zanzibar, which is one of the many multiplayer levels available for the game. This is that same exact level, created by 12 people for Halo Custom Edition which was released by Microsoft as an add-on to Halo 1 for pc. 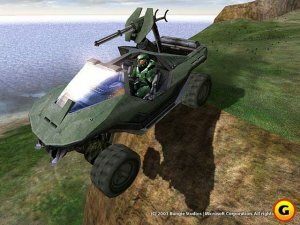 If 12 people can modify Halo 1 to create, in their spare time, what the whole Microsoft gaming studio staff can create full time, the games can't be too different. 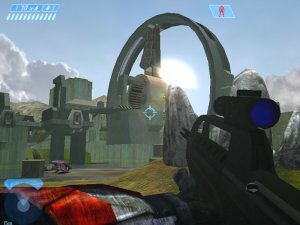 Even when not compared to Halo 1, Halo 2's game play is repetitive, the graphics are the out of date, the enemy AI is not as good as you may think, and it costs $50. 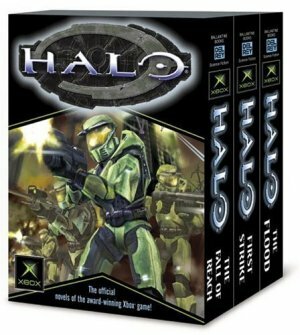 Halo 1 had very repetitive and slightly weak game play. 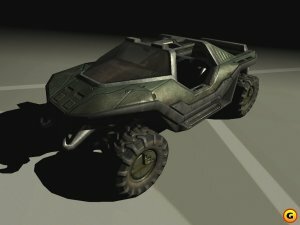 According to Jamie Greisemer, design lead for Halo 2, "In Halo 1, there was maybe thirty seconds of fun that happened over and over and over and over again. So, if you can get thirty seconds of fun, you can pretty much stretch that out to be an entire game." Halo 2 is pretty much the same thing. I don't care what you say, Halo 2 still doesn't look that good (see table under "The Hype" below). The "incredible graphics" consist of a ridiculous amount of spectral effects and bump mapping added to rather dull and cubic wire frames. This makes the game very graphicly intense while still not looking very good or realistic. "The folks at Bungie have outdone themselves when it comes to the enemy AI" (teamx-box staff, November 7th 2004). This would be true except for the fact that whenever I play, there's always an enemy, hiding behind something, who is oblivious of my existence, despite the fact that I am standing right in front of him and aiming my battle rifle at his head. This is the kind of glitch that the "greatest game ever" cannot have. Or maybe it's just when I play. I even took the time to read a rather in-depth summary of the plot, and from what I understood, the developers were too lazy to actually finish the story in the three years that they had to do so, so they decided to leave it as a "cliff hanger." Why do people buy this game? Advertising. So what do I mean by an undeniable truth? This is something that must be true to continue on human existence. No matter what. To help explain, another example is "thou shalt not kill." It is something that must be true, but we cannot explain exactly why. So how does this relate to Halo 2? I dare you to try to argue with a Halo fan that Halo 2 is not the greatest game ever. You will lose, and your life may be in danger. The excessive advertising and hype has made Halo 2's greatness an undisputable fact, nationwide. This hype is rather genius, I must admit. They've made Halo 2 the game that "cool" kids play. 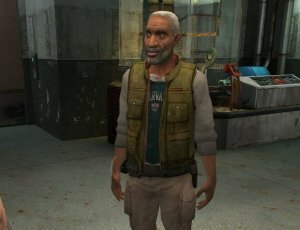 At school, I may try to talk about the features and greatness of the less advertised but in my opinion better Half-life 2, or the fun that I had at a LAN party, only to be labeled as a pariah (also known as a geek). 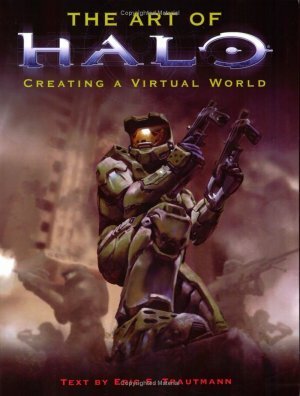 If I were to simply to change the words "Half-life" and "LAN" to "Halo," and "system-link" I instantly rise to the status of "dude" and I am perhaps invited to a Halo 2 system link session. This is because the excessive amount of advertising has instantaneously spread an opinion, however misguided, that is passively accepted by a large enough majority to become the norm. No one ever had to fight for this opinion. Any disagreement to this opinion is quickly suppressed. This same tactic is employed with movies such as i, Robot and Lemony Snicket's A Series of Unfortunate Events. Read this paragraph again and think about it; I'm totally right. I remember back in 2002 when Halo 2 was first announced (I believe it was going to be released in March of 2002). My friend Justin (who was my only ambassador to Halo 1) and I would discuss this game endlessly. 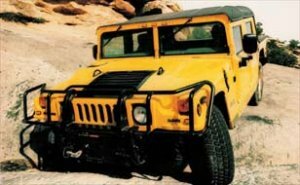 It was said to have 32 player online play, destructible terrain, and greatly increased graphics. Well, two years later, it came out with the same 16 player online play, two years late, with very little destructible terrain, and rather sub-standard graphics. If you disagree with that last point, look at the following table. Which of these looks slightly less retarded? Does this phase any of the die-hard fans? 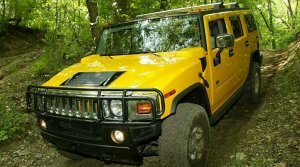 Hell no! They're ecstatic! For the last two years they've built up so much impatience and anxiety that they are blind to the disappointment that Halo 2 is. If you've read these, stop breathing. You're wasting air. What we basically decided to do with the Halo series is create a graphic style that has a very small amount of detail, and vectors, but a massive amount of overused and redundant bump-mapping and spectral effects. 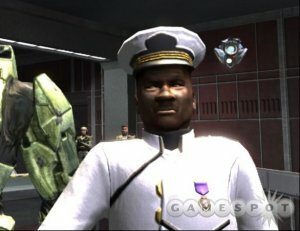 What I want you to get out of this article is that I'm not stating that Halo 2 is a terrible game, I just want you to realize that it's not the greatest game ever, and that if you think it is, it's probably not you doing the thinking. The title of "the greatest game ever" can only be awarded by multivac (for those of you who read Asimov). I still think that Halo 2 is fun, and I plan to buy it when it comes out for PC. p.s. 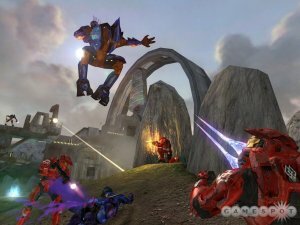 All of the game images for this page with the exception of Halo CE Zanzibar were provided by gamespot.com. If you have any differing opinions about this page, please send them in, I'll post them below.